In this day and age, gaming has become a seriously big business. There has also been an increasing demand from a lot of individuals who want to steer clear from the 60-fps limit on high refresh rates; the demand is to also go over 1080p resolution, enjoy gaming in VR, and a lot more. This is generally possible if you have an efficient and faster graphics card to solve the issue. Today, we’re going to focus on the Gigabyte AORUS GTX 1080 Ti which has already proven to be one of the best and most efficient gaming cards today; it also looks much better than other graphics cards around. It comes with factory overclocks, a huge cooler, and a surprisingly competitive price, which makes the GTX 1080 Ti is definitely something you should keep an eye on. The company’s graphics cards are all made for perfection since they aim to provide the best graphics experience for every gamer around. Since their products are also based on the progressive NVIDIA Pascal – GPU format, this graphics card such as the GTX 1080 Ti will surely provide you with an intense gaming experience. Let’s learn more about this product: how it works, what its features are, how it performs, and if it’s worth purchasing to complete your gaming build. First up, let’s check out its package and the other accessories that are included in the box. 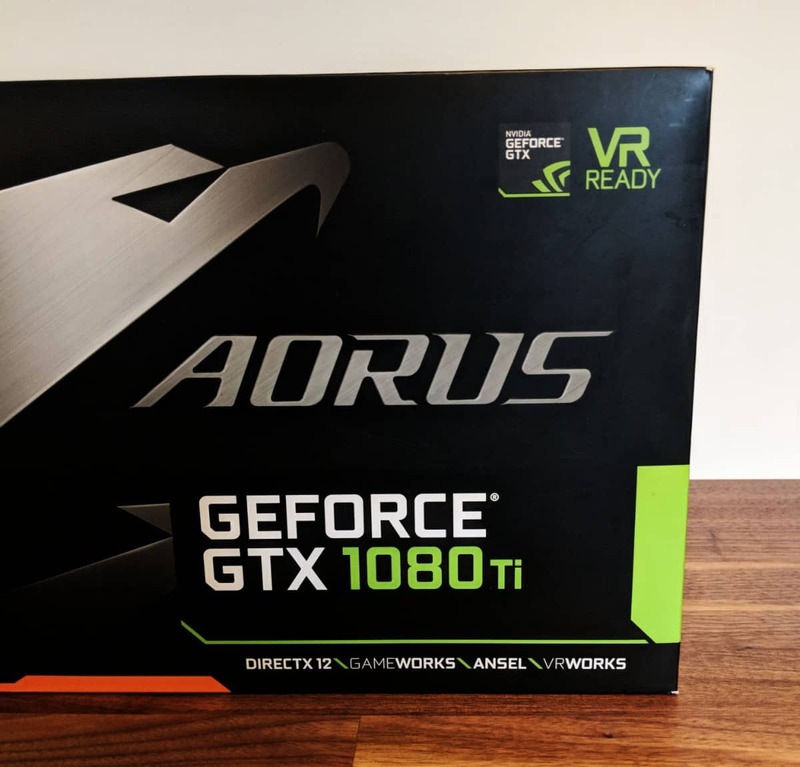 Gigabyte AORUS GTX 1080 Ti Review – What’s in the Box? The AORUS GTX 1080 Ti comes in a black box that features a simple and clean design, giving it a cool look. The front of the package features the product’s name written in bold fonts; plus, it also displays some of the key features of the products which can be found on the lower left portion of the container. Once you flip the box, the back of it will give you more information about the GTX 1080 Ti’s key features. Aside from these, there’s nothing more to see on the box so we went on and checked out what’s inside. When you’ve opened the box, you’ll find another box inside which you’ll have to pull out. 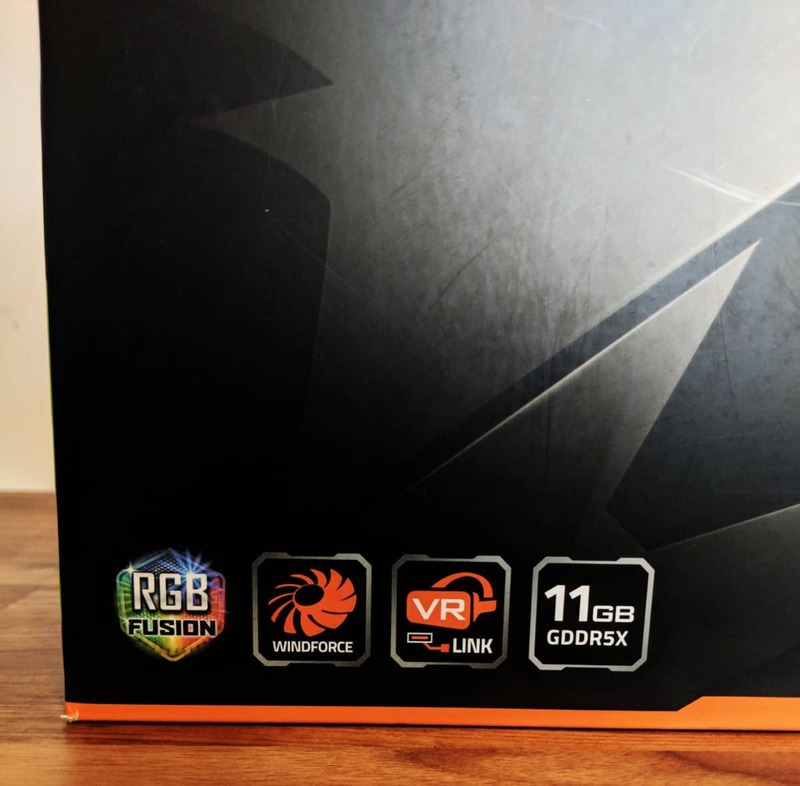 It’s just a simple package that only features the AORUS logo at the top. Here, you will find a black envelope that also features AORUS’ logo right at its center. Once you open the envelope, you will find a CD driver and a badge. Now under this, you’ll find a black division that looks just like an EPS foam. This further protects the graphics card when being delivered to your place; plus, it also keeps everything in position. Once you pull out this division, you’ll find the GTX 1080 Ti graphics card and a cord: each of these items are set in their own areas to keep everything neat and easier to find; it also safeguards the sides of the product. Additionally, the cord and graphics card both have their own plastic pouch for carrying when you need to bring the device elsewhere. Gigabyte AORUS GTX 1080 Ti Review – What a Beast! The first thing that we noticed about this graphics card, and we’re sure that you will too, is how big it is. It sports a thicker design compared to other similar products and may interfere with SLI setups on some other motherboards. However, if you’re looking for one fast card for your build, then this won’t even be an issue. Its bigger design lets you utilize three 100-millimeter fans which means that there is more airflow even with a lower RPM. Of course, fans with much lower RPM have lesser noise which is really a good thing. And just like every other item in the gaming market, this product is equipped with RGB lighting. It features an X shape right at the top together with four LED bars, and if you look at the AORUS logo on its side, it is RGB lit as well. What’s great about this is that you can also customize the colors or choose to turn these off as well; if you’re someone who enjoys tinkering with configurations, then this is something that you’d definitely enjoy. Connectivity is also excellent, with a DVI-D, three DPs, as well as two HDMIs – these are all the necessary connections that you will need; and another plus is that all of these come with 4K support. Underneath the back of the card is another HDMI port which is useful if you have a VR connector located on the front area of your chassis. This makes it easier and quicker to connect without having to bother with cables that trail around your computer. Its huge cooler design is also supported with an adequately-sized backplate; there is an opened section right over the chipset which lets you see a copper vapor chamber. This area feeds through five huge copper heat pipes to the available two-part radiator style. All in all, we’d call this a gigantic monster card. As for its build, its quality is undeniably top-notch and its cooling solutions is outstanding and well thought of for each component present. Generally, this should maximize and boost its lifespan, as well as the overclocking potential. Either way, the GTX 1080 Ti stays quiet and cool, while its semi-passive fans and the modifiable RGB lighting tick off additional feature boxes. AORUS also provides the best flexibility when it comes to the display outputs. The AORUS GTX 1080 Ti also gives you two specific modes of use: first is the Gaming Mode wherein the graphics card’s GPU works with a base clock of 1569 MHz and a boost clock of 1683 MHz. When it is on OC Mode, the base clock will be at 1594 MHz while its boost clock will be at 1708 MHz which is rather conservative. You can make the card work faster with just a couple of tweaks and you’re good to go. The Gigabyte AORUS GTX 1080 Ti is equipped with the newest Windforce Stack 3-X cooler, making it one of the best graphics cards in the market today. This huge cooling solution makes the card thick, but despite this, the device is still worth the purchase. This is because the GTX 1080 Ti allows for high levels of overclocking of up to twelve plus two power phases. It is powered by GeForce GTX 1080 Ti and features a built-in 11-Gigabyte GDDR5X 352-bit memory interface. Gigabyte refers to the cooler as the Windforce Stack 3-X which stems from the idea that there are three available fans that are all stacked in a unique yet effective arrangement. The middle fan can be found sitting just below the two outer fans while their blades overlap each other; these also spin in opposite directions which is quite interesting. Gigabyte claims that the configuration lessens turbulence, optimizes air flow via the massive heatsinks found underneath the device, and it also eliminates dead spots. 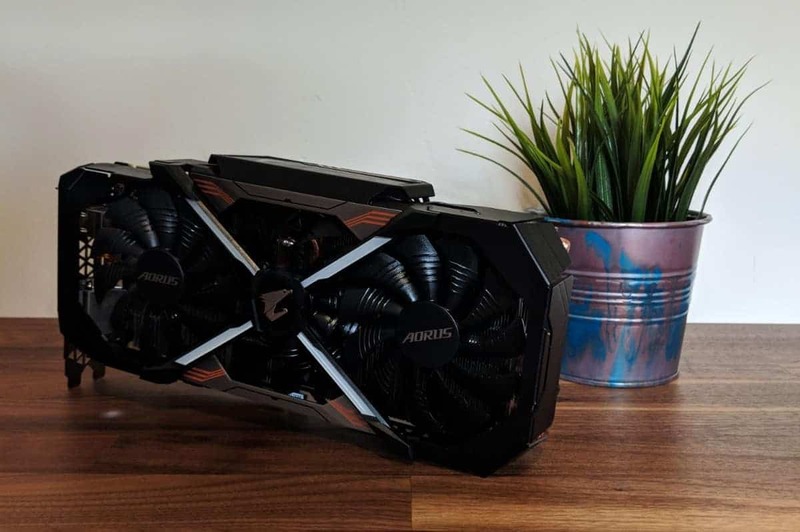 We can’t really affirm these claims but all we can say is that the AORUS GTX 1080 Ti stays really quiet despite long hours of gaming and even under heavy loads, plus it also does an excellent job at maintaining its coolness. Underneath the fans, you’ll find a huge heatsink with angular fins to boost its surface area. This is linked with the thick copper heatpipes that are present. The heatsink is the fixed to the copper base plate, making direct contact with the GPU and the 11GB of the GDDR-5X RAM present on the card. There is another base plate present that makes direct contact with the card’s VRM; it should be known that the back portion of this VRM has direct contact to the rear plate, and there is an extra copper heatsink found right at the back of the GPU as well. You will see that there is a lot of metal and moving air on this product, and these all function simultaneously to keep the card cool. This configuration works excellently and despite heavy loads, it remains quiet; just keep in mind that the GTX 1080 Ti takes up three slots so depending on the slot spacing, the SLI may not be an alternative with some motherboards. The graphics card is specifically designed for you to enjoy excellent graphics while gaming. It is based on the NVIDIA Pascal GPU architecture for gaming enthusiasts to completely enjoy their gaming experience. 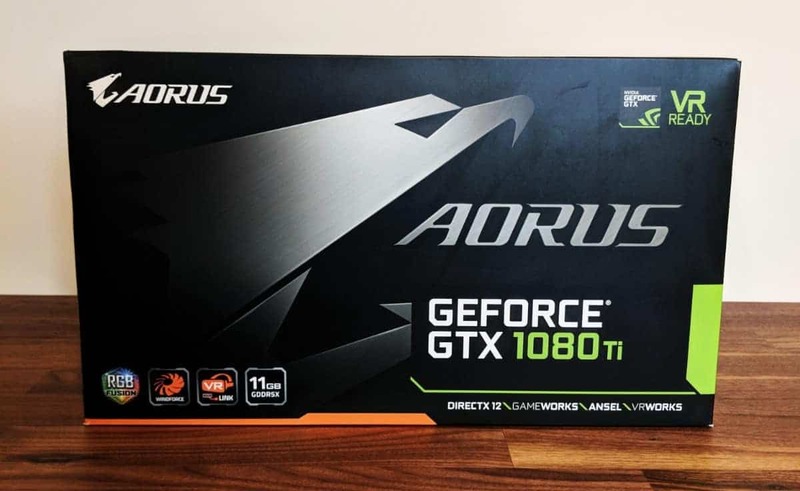 If you want to have a cooling solution for all the vital elements of your graphics card, then the AORUS GTX 1080 Ti is perfect for your needs. Gigabyte made sure to enhance and improve not only their GPU, but also their MOSFET and VRAM to give you longer life, as well as a more stable overclocking operation. In front of the device, the copper base plate that is present depletes most of the heat that comes from the VRAM and the GPU; for the copper base plate at the back of the GTX 1080 Ti, it helps dissipate the heat coming from behind the GPU. As for all the other main components, these are all taken care of by the Windforce cooling module. With all of these, you can really say that the company made sure that the cooling solution of the GTX 1080 is adequate in many ways. The AORUS VR Link is probably the only output technology today that can support a variety of combination displays. What’s nice about it is that you don’t need any adaptors to make this work. Another nice thing about the GTX 1080 Ti is that it has 16.7M color choices and various lighting effects, allowing you to choose the perfect scheme for your gaming rig via the AORUS graphics engine. The AORUS VR Link also features an additional front-facing, plus two rear HDMI ports. This will let you easily link a VR device and up to two HDMI monitors simultaneously without having to bother swapping cables. This lets you arrange a display setup that is adequate for your gaming needs and preferences. Not all similar products feature a black metallic back plate like the AORUS GTX 1080 Ti. It is a convenient feature since it provides better protection while also strengthening its whole structure. For better protection against elements such as dust, abrasions, dirt, etc. the company utilizes a special PCB coating for its GTX 1080 Ti. A dust-resistant feature protects the device’s circuit board from little insects, drill shavings, dust, abrasions while moisture-resistance prevents board damage and unnecessary conduction paths. When it comes to corrosion-resistance, this safeguards the boards from various contaminants from the environment like humidity, salt spray, corrosion, humidity, and more. The GTX 1080 Ti also features LED power indicators to help you know if the PSU’s PCIe voltage is stable. If there are any power abnormalities, you will be alerted by the LED’s flashing lights which is pretty useful and convenient in our opinion. Compared to the previous generation AORUS SLI High Bandwidth bridge supports two-way SLI setups since it doubles the present transfer bandwidth bridge to provide you with the best 4K gaming or surround gaming experience. The SLI bridge also features its customizable 16.8M color lighting with various effects; with this, you can readily synchronize the lights with the graphics card via the Engine Utility of AORUS. If you compare this to the reference design, the 12 + 2 power phases available on the card makes the MOSFET work at lower temperatures while simultaneously offering a more stable voltage output. Load balance and over temperature protection for each MOSFET can efficiently extend the card’s life. This GTX 1080 Ti is engineered with the highest quality capacitors and chokes that are similar to those of the Titan X. This delivers excellent quality performance as well as a longer lifespan for the system. The product was crafted with a user-friendly design and this is all thanks to the completely automated production method that the company utilized. This specific process guarantees that you’ll receive top-quality circuit boards, eliminating the sharp protrusions that are usually present due to the solder connectors which are seen on common PCB surfaces. The design also restricts your hands from receiving unnecessary cuts from carelessly damaging parts when constructing your build. Let’s talk about the performance of this graphics card and see if it’s something that you’d need for your gaming. This is undeniably a powerful GPU so it needs to have a bigger cooler; and honestly, it’s one of the biggest GPU coolers around. When using the device for prolonged hours, the fans are still quiet and just reaches 43 dBa so you won’t really hear anything unless you stay in a really hot room with poor ventilation and an open-air chassis. Noise isn’t an issue when it comes to the GTX 1080 Ti. Even if the card features three fans, these completely slow down when idle; with that, the cards do not really produce any noise which is really good. Under heavy load, the fans spin faster, but with a lot of air circulating and with its huge heatsink, these do not need to have an increase in speed so the card stays quiet. We should also talk about the card’s temperature because we didn’t have any issues with this. When idle, the GTX 1080’s GPU lingered around the thirty-degree and above range; when it was under sustained load, the GPU temperature didn’t even hit the default target. Even when we overclocked the GPU, it only peaked at around 70 degrees Celsius. This is really great since we were expecting it to really heat up at some point, but based on our tests, it was still cool all throughout so we’re giving this two thumbs-up. Overall, the Gigabyte AORUS GTX 1080 Ti is an excellent graphics card, and if you don’t really mind its huge, triple-slot cooler, then this product will definitely offer you, and discerning gamers, a lot of advantages. The Windforce Stack 3-X cooler is effective and really quiet; the card is able to overclock outstandingly and it also features a flexible output setup. It can also accommodate front-mounted HDMI ports to help attach the VR HMFFs, user selectable frequency modes, and customizable RGB lightings. Its performance is also excellent and this is all because of the powerful GPU and factory overclock available. Installing the AORUS GTX1080 Ti GPU is a piece of cake. So simple in fact that Gigabyte has put together a video showing you exactly how to do it! There is a strong competition in the market of high-end graphics cards, and we’ve already seen a number of top-notch brands around. It is a great thing that the AORUS was added to that list of graphics cards. While its size can be a little too big for others, a lot of us would just utilize a single GPU so the AORUS GTX 1080 Ti will not be an obstacle for a lot of motherboards. All of the products released under the GeForce GTX 1080 Ti series are some of the fastest graphics cards in the market, with the GTX 1080 Ti getting the second spot on this list. At the end of the day, getting the GTX 1080 Ti means that you are owning a great graphics card that can handle a wide range of tasks. Another thing we liked about it is the parts of the graphics card since its advanced backplate cooling is made from copper. This effectively transfers heat from the interior cores to the heatsink. The backplate of the rear-side GPU is also made from copper which is another thing we appreciated since it was able to regulate the temperature of our card while overclocking. With the AORUS GTX 1080 Ti, we can say that you will really get what you pay for: the construction quality is excellent and the cooling solution was perfectly designed. This will help lengthen the card’s lifespan and overclocking capacity which is necessary for every gaming enthusiast around. The cooler also helps maintain the temperature of the GTX 1080 Ti while simultaneously keeping its noise levels low. Aside from this, AORUS also provides flexibility when it comes to the display outputs. If you’re looking for a graphics card that offers 108p 120 FPS+ or if you own a 2560 x 1440 gaming display at 144 / 165 Hz, you should consider getting the AORUS GTX 1080 Ti. During our test, the card was also able to handle 80 to 100 FPS without any problem and we can say that it is a great graphics card for wide gaming monitors today. Overall, we highly recommend the Gigabyte AORUS GTX 1080 Ti. If you want the Gigabyte AORUS GTX 1080, you can check out Gigabyte’s store locator on the company’s official website to which authorised resellers, distributors, and online shops sell this product. If you are located in Australia you can pick one up for around $1,239AUD. For more information take a look at the official product page. Got this graphics card at the start of the year and ever since it has changed my way of playing video games. Having to run games at its best with no trouble. So far I feel like I will love this graphics card for the rest of my life.